The app has hit end of life with iOS8. GeneIndex quickly provides information about genes from various sources. It also includes a RSS reader for journal feeds as well as a PubMed viewer. * Look up genes by symbol or description. * Gene indexes for many mammals, plants, invertebrates, and bacteria. * Link to gene info on websites. * Query GeneRIF interactions, COSMIC mutations, and CNV data for cell lines. * Does not require a network connection for local databases. 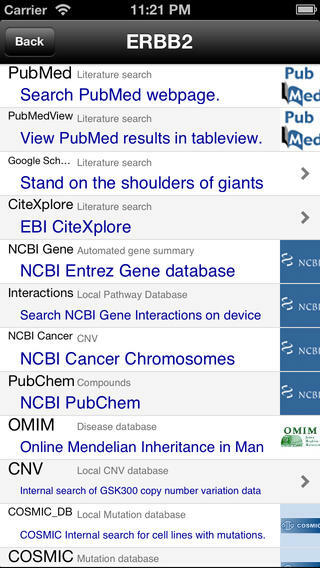 * View and search PubMed in table view. GeneIndex provides a convenient and portable way to lookup gene symbols while at a seminar, conference, or lab meeting. Genes are linked to common life science websites such as NCBI, COSMIC, KEGG, PubMed, BioGPS, UCSC genome browser, Pathway Commons, Genatlas, Wikipedia, HUGO, cBio, and OMIM. GeneRIF gene interactions can also be queried. Examine the status of genes in common cell lines. A subset of COSMIC containing cell lines can be queried for mutations. Copy Number Variation (CNV) plots from cell lines profiled by GSK and Sanger are also linked to genes. Use GeneIndex to discover and read scientific literature. Links to 1000+ scientific and medical journal feeds and PubMed searches allow one to find relevant articles, read abstracts, and download PDFs. View article titles from current issues of leading journals such as Science, Nature, Cell, JAMA, New England Journal of Medicine, and American Institute of Physics Journals. Many open access journals such as PLoS are listed. Batch download PDF files from RSS feeds or PubMed searches. If you ever wanted to read a complete issue of Nature, it requires downloading 20+ PDF files with cryptic filenames. The auto download feature will download, rename, and link all the files in the RSS feed for easy access. Bookmark your own RSS feeds and website links. PubMed searches can be converted into RSS feeds that can be saved for future lookup. Please do not use reviews for technical help. Contact geneindex@gmail.com or post your question at www.facebook.com/geneindex so that more information can be obtained to diagnose the issue. This version is Ad Free. Note: Institution based PDF downloading via Athensams or similar authentication is not supported. You can test downloading using the free app GeneIndex or JournalRSS.